Hey guys, it’s Jpixx’s new Marketing Intern Calvin here, bringing you a new blog post fresh off the press. 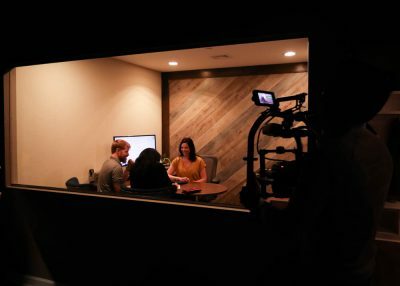 A couple weeks ago I was able to attend my first ever video shoot with Jpixx! 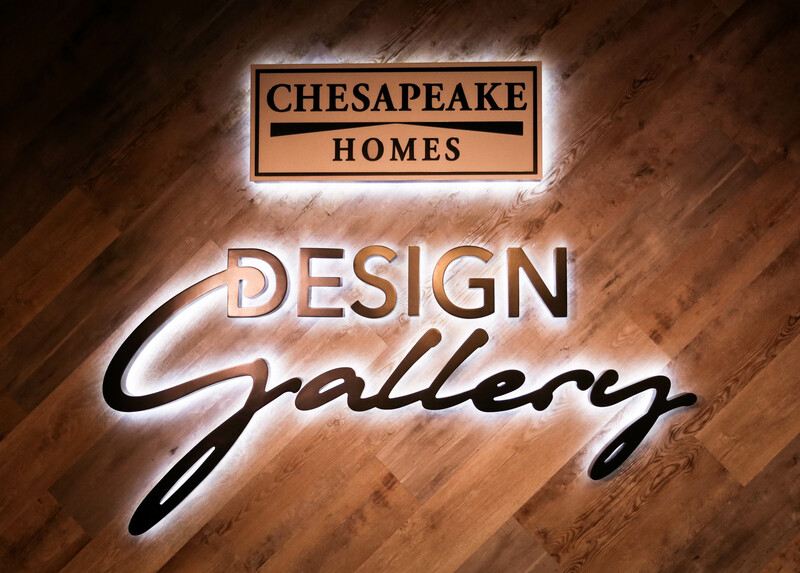 We had the chance to work with Chesapeake Homes to film a promotional video at their lovely Design Gallery. 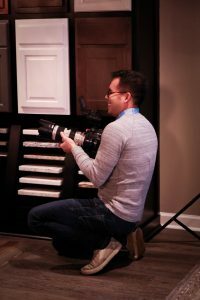 Their design gallery is where you are able to choose from a wide array of products and finishes to customize your brand-new home. 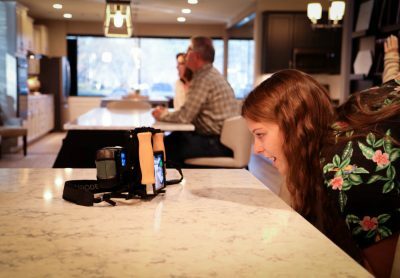 They have everything from cabinets, to flooring, to countertops, and more, including some of the latest smart-home technology. 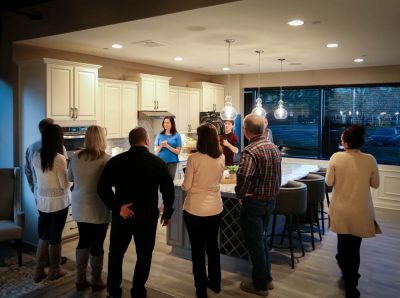 To get started, homebuyers will attend a Preview Event, where a Design Gallery Consultant will take them on a tour of the design gallery and allow them to ask questions and get hands-on with the various home accessories on offer. This is the experience we were trying to capture on film. 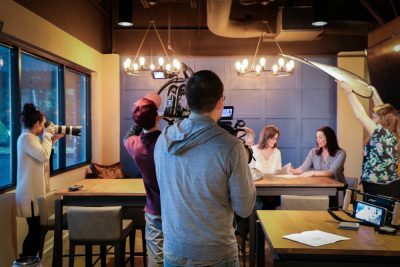 Our shoot spanned across two days, with the crew on-set comprising of Jessa, Jslay, Lizzie, myself, and of course the boss himself, Jon. We were also accompanied by the ever-entertaining Lynn of Easton Advertising, our client, who kept diligent watch over proceedings and kept spirits high. 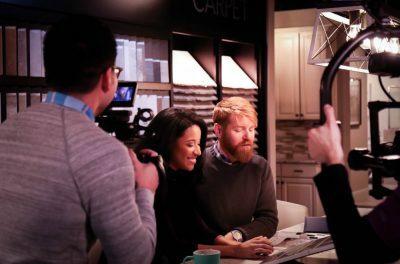 Each day saw us working with different on-screen talent, though both days saw us working with the incredible Stephanie as our Deign Gallery Consultant, a job she performs flawlessly both on and off camera. 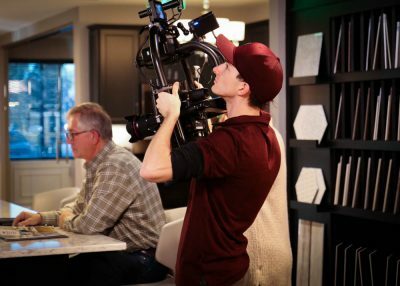 Day one was an early start at 7 a.m., and it focused on filming a young couple as they toured the design center. They were played by Jpixx freelancers Dominique and Will, who honestly might want to give up freelancing and start acting full time. 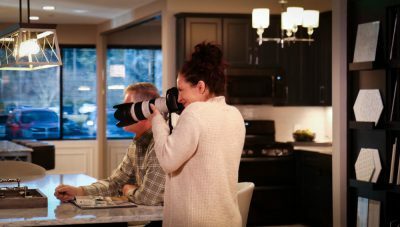 The cameras followed them as they looked through high-end home finishes, guided by Stephanie, as we meandered through the gallery, ending up in the office, where pen was put to paper on a new home. 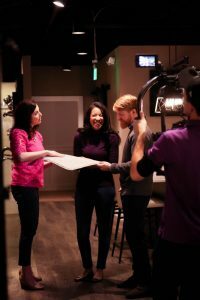 In between we also filmed group shots in the kitchens and smart-home area, with yours truly playing one of four extras that accompanied Dominique and Will. All in all, day one was a huge success, and we walked away with the shots we needed, looking forward to day two. The second day saw us start at a more reasonable mid-day and involved a shift from young couple to older couple, though our talent Patty and John showed us that age is but a number with their acting prowess. We were able to get a different variety of shots with them, including areas from the previous day seen from different angles and new areas altogether, including a shot from outside, where it was rather chilly. This day also saw another group tour with four new extras, where they ventured through the kitchens and the bathroom display. We ended again with a shot in Stephanie’s office, where Patty and John were delighted to sign off on a new home. Day two saw us wrap with a fun little Jpixx video of Jon sitting on the toilet in the bathroom display, yeahhh don’t ask. 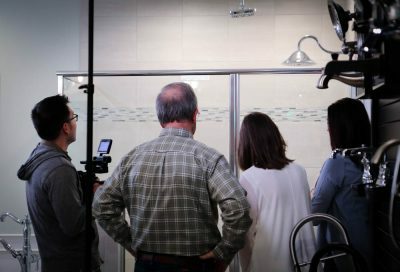 Overall, I had an incredible time on my first shoot. It’s really cool to get to be on set and see the sheer amount of gear and work that goes into getting the right shot. It’s also amazing to be around such a fun and talented crew. 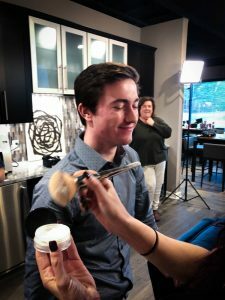 Throughout the shoot I was able to get some good behind the scenes pictures, which are strewn throughout this article for your viewing pleasure. I was also able to capture media for our socials, so if you’re not following them, check out our Instagram and Facebook. Here, you’ll get all the juicy behind the scenes content Jpixx has to offer. In the end though, I really enjoyed by first shoot and I’m looking forward to the next! I know we’ve got loads lined up. 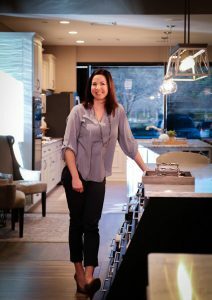 Also, be on the lookout for a possible blog post as Jpixx takes to the road to continue our Chesapeake Homes adventure!